The Lakers came out hungry and focused in game 5 and just finished off the Rockets from the first moment. They had an 11 point lead at the end of the first quarter after Farmar’s last gasp three, led by 25 at the half and didn’t stop pounding the Rockets into the ground until the fourth. 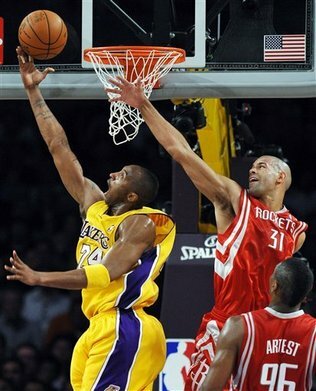 Kobe Bryant scored 26 points and didn’t even play in the fourth. He had 20 by halftime and was undisturbed by Artest and/or Battier. Pau Gasol played great, scoring 16 and grabbing 13 rebounds while Ariza, Bynum, Farmar, Odom and even Powell scored in double figures. The Lakers 118-78 win was their first 40 point win since 1986 (over the spurs) in the playoffs and it was also Phil Jackson’s 200th playoff win, the first coach to reach that milestone. For the Rockets it was their worst playoff loss ever. The Rockets shot 32.9% from the field and 5 for 29 from three, turned the ball over 18 times and were just not in the game. It seems all the hype from their game 4 win went to their heads, and they actually believed the people saying they’re a better team without Yao. Now they know they’re not, and it will take their best effort to beat the Lakers in game 6 and maybe that won’t even be enough.